Welcome to Pinelands Pediatrics! Thank you for choosing us to care for your child. Together we will work to ensure the health and safety of your child. Our goal is to ensure the highest quality of healthcare in a warm, friendly and respectful environment. To give you, the parent, all the information necessary to make informed decisions on your child’s behalf. That way, we may form a partnership to provide the best care possible to your child. We encourage you to ask questions and engage in discussions so that you may fully understand your child’s diagnosis and treatment. It is very important to follow through on our recommendations for your child. This includes but is not limited to making follow up appointments when requested, administering medications that are prescribed or getting tests completed when ordered. On our part, we will do our best to make sure you receive the results of any tests in a timely fashion. However, if you have not heard from us, do not hesitate to call. 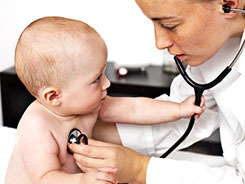 We promise to uphold the highest standard of care when treating your child. Therefore, we want all of our patients fully vaccinated. Not only does this protect your child from possible life threatening illnesses, it is a comfort to know that when your child is too young to receive certain vaccinations or has a compromised immune system, the rick of them contracting one of these preventable illnesses, in our office is greatly diminished. We understand that time is in short supply for everyone. Therefore, we will make every effort to see you at your appointment time. We ask for your patience when we are delayed due to unanticipated emergencies or when a patient has complicated health issues and therefore requires more time. Please know that should the need arise, we will provide your child with the same consideration. In this regard, we ask you to be on time for your appointments, give us advance notice if you are unable to keep an appointment and treat them with the same courtesy and respect that they bestow upon you and your child. Thank you again for choosing Pinelands Pediatrics to partner with you in providing your child with the highest quality health care! Are you a new patient? Download and complete our insurance forms before your appointmant.